For many Americans in the 1980s, the runways of New York Fashion Week might as well have been on Mars. Instead, would-be fashionistas from coast to coast took their notes from the TV characters that popped up in their living room each week. From Dynasty’s bougey glamour to Miami Vice’s casual coolness, game-changing style on TV inspired the masses and helped move fashion toward the more accessible industry it is today. Here, the brains behind five of those series’ designs reflect on their work and legacy. Tillen credits Michael Mann, the show’s visionary executive producer, with creating the overall aesthetic—the t-shirt under a blazer was his idea, as was a dedication to pastels. And then there were those suits. While the collective conscious today remembers them all as Armani creations, that’s not the case. “There was not one piece of Armani clothing in the year that I was there,” says Tillen. “It’s too conservative—gorgeous, but very conservative.” Instead, she preferred the “crazier” styles of Versace. Tillen left after Vice’s first season, passing the reins to Bambi Breakstone for the show’s sophomore outing. Breakstone did introduce some Armani, but her focus was on the then rising Hugo Boss. “We really didn’t have the budget I wanted, so I arranged to give them credit at the end of the show, and they supplied a lot of clothes in exchange,” she says. Breakstone evolved Johnson’s look, introducing what would become another of the show’s staple: rolled-up sleeves. Realizing how small in stature many of the Latino men playing gangsters and drug dealers on Miami Vice were, she applied a lesson she’d learned as a student of costume history. She recalled how Queen Elizabeth I had worn incredibly wide garments, extending up to 25 inches off either hip. “By taking up that much space, it gave her authority over the room because people had to move out of her way,” explains Breakstone. So she dressed the men in bigger clothes. With minimal time for alterations, rolling up the sleeves was simply a necessity. So Doucette ignored what kids were actually wearing those days and focused on what they would wear if they had sartorial autonomy. Among his finds were two things he hoped would make the look special for the young Soleil: sun-shaped barrettes (her first name is French for sun) for her pigtails and moon-shaped earrings. So Bach headed home and brought in an alternative: a pair of jean shorts she’d cut from her own bell-bottoms. Extra-short from cutting higher and higher as Bach tried to get the sides even, the shorts were a hit with the producers. Bach, who had spent two years in design school, became in charge of making more. She estimates she created around 20 pairs, often out of size 4 or 6 Levi’s, for the show’s early episodes before a costume designer was brought on. (You can also thank Bach for that famous red bikini). But producers, fearful of CBS sensors, required her to wear skin-tone tights underneath the shorts. “They got the thinnest, silkiest, finest pair of nylons and put those on me,” says Bach. So did she always wear them? “When I remembered,” she recalls with a giggle. This spring, it will all come full circle for Bach, who says she’s opening up a store in Nashville in April to sell tourist items and other things she’s made. The name? Daisy Country by Catherine Bach. Each of the leads had their own sense of style, based on the preferences of both the character and the actress. 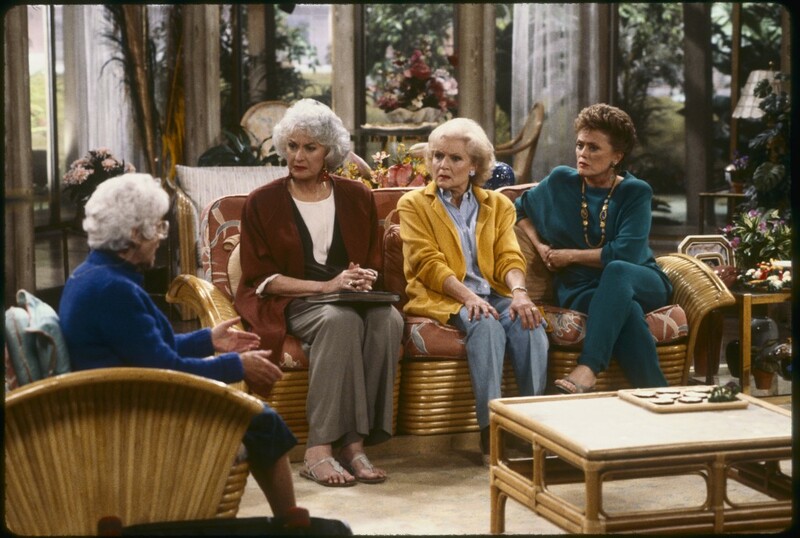 Rue McClanahan’s Blanche was unafraid to show a little leg or cleavage or both. Betty White’s Rose was more conservative, frequently wearing shirtwaist dresses. For Bea Arthur, Evans went with a “tailored, sophisticated” look because Dorothy “kind of lorded over the others.” She wore lots of suede boots and long skirts, but rarely heels because Arthur didn’t like them. Viewers of a certain age couldn’t get enough. “The difference between a costume designer and a fashion designer is [the former is] designing for the person literally. With fashion, you’re designing for the ideal woman,” says Evans. “We didn’t have four ideal women, by any means. [That] appealed to a lot of people.” Evans was flooded with inquiries about her designs, and often, she’d pay that support back, sending fans a copy of a sketch and a fabric swatch to take to a dressmaker.